During the September school holidays Arkade graphics produced a mural for the external play area of Shelton Lower School. 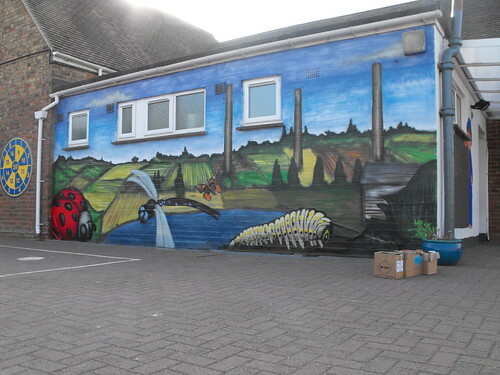 Loved by pupils , teachers and parents alike the mural was just what the playground needed to brighten things up. Completely in keeping with the schools location the mural featured a mix of the rural and industrial heritage which surrounds it. This entry was posted in Commissions and tagged Bedford graffiti, Graffiti in bedford, i want a mural in Bedford, Mural art in bedford, Murals in Bedford, paint my school, paintings in schools, paintings on schools, school paintings, who did a painting in bedford ?. Bookmark the permalink.